Our health system excels at providing highly-specialized, cutting-edge, even envelope-pushing treatments for patients with serious illness. Sooner or later, all of them fail. The capacity of the system to meet the other needs of patients with serious illnesses – for basic pain and symptom management, emotional support, information and decision-making guidance, and planning and coordination of needed resources throughout the illness trajectory – is widely acknowledged to be poor. In spite of the continued growth of hospice and hospital palliative care programs, there is an enormous gap in access to palliative care for the 45 million Americans (18% of the US population) with both serious chronic conditions and functional dependency who are neither hospice-eligible nor hospitalized – a number that is growing rapidly. Patient Identification: Moving towards universal access to high-quality serious illness care first requires recognition of patients with serious illness as a defined population. Amy Kelley, MD, and others have proposed the following definition: Serious illness is a health condition that carries a high risk of mortality and either negatively impacts a person’s daily functioning or quality of life or excessively strains his or her caregivers. While numerous approaches to identifying this population have been explored, so far they tend to be better at identifying patients who are closer to death, after multiple hospitalizations or significant functional decline. We need more inclusive approaches that allow patient identification to occur earlier on the illness continuum. At the same time, inclusion criteria need to be narrow enough that it is realistic for busy clinicians to focus enhanced attention of this population. Although various approaches exist (e.g., The Surprise Question), none are optimal, and population- and needs-based patient identification remains a significant challenge for our field. 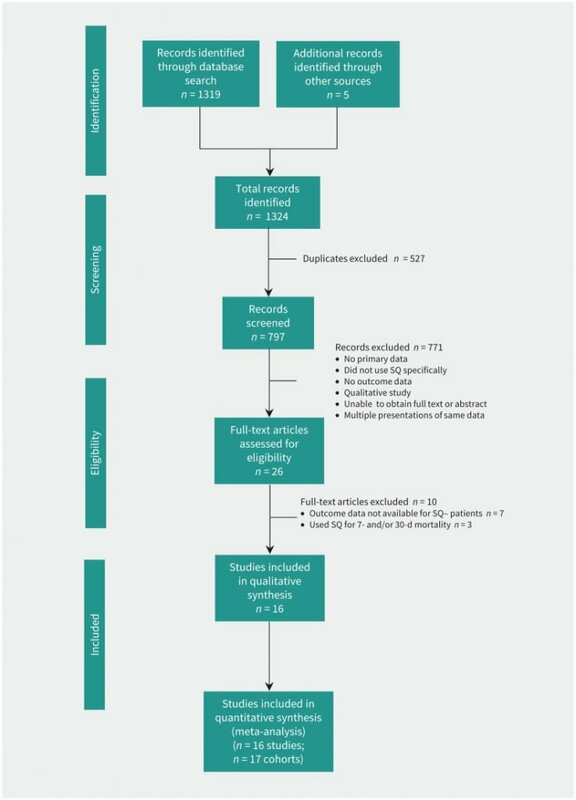 Study selection for the systematic review. SQ = surprise question, SQ− = response to SQ is yes. CMAJ. 2017 Apr 3; 189(13): E484–E493. Electronic Health Reports Optimization: Our EHRs fail to support high-quality serious illness care:, they neither mandate recording of essential clinical information (such as functional and cognitive status and patient priorities for care) nor do they standardize the recording of and access to the information necessary to support patient identification, management, communication, and coordination. Most relevant information, if recorded at all, is found in progress notes, making it burdensome to access. Clinicians have not been trained to use the capacities that do exist in the EHR. 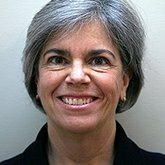 Palliative care clinicians can lead their institutions in advocating for and implementing a “single source of truth” for all advance care planning information in the EHR, and in training their colleagues about the value of collecting and reliably recording this information in one place. Measurement: Population-level measurements for patients with serious illness can guide systems in patient identification, needs assessment, and care improvement. Using both prospective identification (e.g., The Surprise Question) and retrospective identification (e.g., institutionally-collected data about patient deaths, state death data) is essential to this process. Palliative care leaders should assess the availability of data about in-hospital and out-of-hospital deaths of patients cared for by their system, and begin the process of collecting a registry of all deaths that meet certain criteria (e.g., all patients seen in the system hospitals or clinics two or more times in the six months before death) to enable both assessment of current state and improvement. Such data will allow systems to answer such questions as: What proportion of our seriously ill patients was seen by palliative care? What proportion had a health care proxy? A documented conversation about values and goals? A MOLST or POLST form in the EHR? How many were in a hospital or ED in the last months of life, and how many times and for how long? Such data provide a road map for improvement efforts. 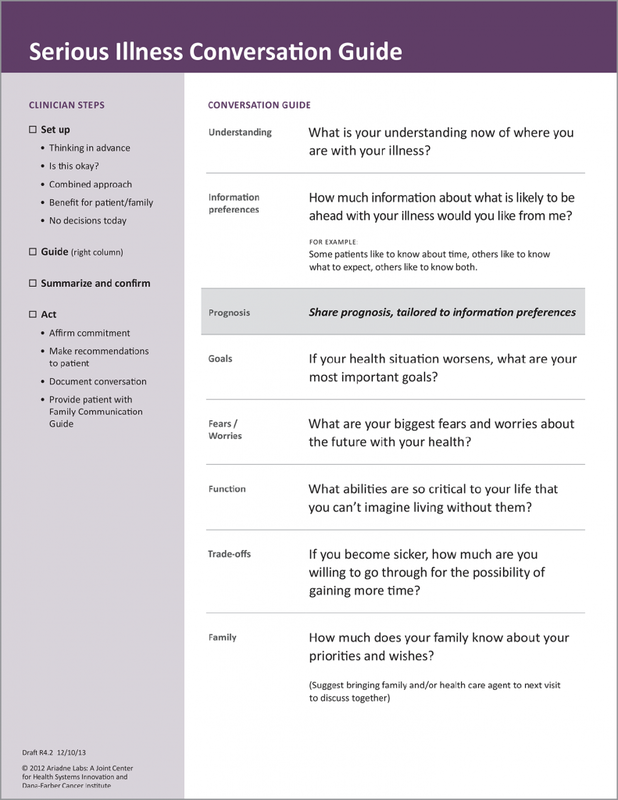 Communication: All clinicians who care for seriously ill patients should be appropriately trained to carry out high-quality conversations about what matters most to their patients. In order to achieve this goal, training should be focused on basic competencies, taught by experts in serious illness communication, and condensed enough to be available to all appropriate clinicians. Multiple models exist for such training (VitalTalk, Serious Illness Care Program, Respecting Choices). Measurement of clinician participation in training is an important benchmark for quality. Symptom Management: Clinicians who care for seriously ill patients require training in the core knowledge and skills of pain and symptom management that they did not receive during undergraduate and graduate education programs. Not only are symptoms a key source of suffering for this population, but they comprise the primary reason for unplanned emergency department visits and hospitalizations. A number of resources, including the on-line curriculum of the Center to Advance Palliative Care (CAPC) and others, are now available and easily accessible for mid-career training in the core competencies of pain management and symptom management. Institutional requirements for minimal competency in this area can be developed and promulgated and clinician participation in such training is another key quality benchmark. Care Planning and Coordination: Many clinicians who care for seriously ill patients lack understanding and/or awareness of resources available to patients to address practical, emotional, spiritual, and social needs. Social and environmental factors (such as access to food, housing, transportation and safe neighborhoods) account for more than 60% of all healthcare spending. Engagement of the full multidisciplinary team is needed to optimize this awareness and competency in identifying and addressing these non-medical determinants of health. New models of care and training are necessary to help teams identify such needs, and connect their patients with appropriate resources. Team training on this process should be a core responsibility of palliative care programs. For further discussion on serious illness and related topics regarding palliative care, please join us at CAPC National Seminar 2019 and Pre-Seminar Boot Camp.